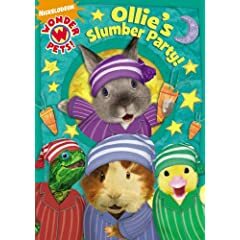 In the newest release, with over 90 minutes to enjoy from this 2008 Emmy Award winning show, Ollie invites the group to a sleep over. Though Ming-Ming is reluctant, Linny persuades them that it will be fun to spend the night underground. Ollie is so excited to have the group sleep over that he cannot fall asleep. The Wonder Pets use teamwork to help Ollie count sheep–they dress up as the sheep–and soon Ollie falls asleep. And snores. Wonder Pets! : Ollie’s Slumber Party will be released on June 9, 2009.
below. Last date for entries is June 10, 2009.